In this unusual restaurant, guests can enjoy the favourite dishes of famous writers. Designed by KUSANAGI Yohei, this restaurant allows guests to taste writers’ dishes. Japanese literature is full of descriptions of meals, and books of recipes by literary writers are not uncommon, just as in France. In the Museum of Modern Japanese Literature (Nihon kindai bungakukan), two stations away from Shibuya and in close proximity to Tokyo University, hidden away in the heart of a residential district, you’ll find BUNDAN COFFEE & BEER, where you can actually eat dishes once loved by writers, or which they themselves even used to cook. It was the brain-child of Kusanagi yohei, who, one could say, always comes up with unusual ideas to do with books. He’s just opened a specialist bookshop in Shinjuku, for books about “love”, in the fashionable district of Kabukicho, where attractive shop assistants help you choose your own personal selection of books based on the kind of love-life you desire. “It wasn’t the idea that came first, above all, it was the space itself that determined what we should do. For the café, the Museum suggested we use a former canteen, and the idea of tying in food to literature just came naturally”, he tells us. So, for the past five years, lovers of literature have been coming to discover the “taste of books”, in retro surroundings with walls covered in books from his own private collection. “I’m addicted to books, it’s a little like the place of my dreams. When reading novels, I used to dream of eating the dishes described in them.” Now, his dream has come true. 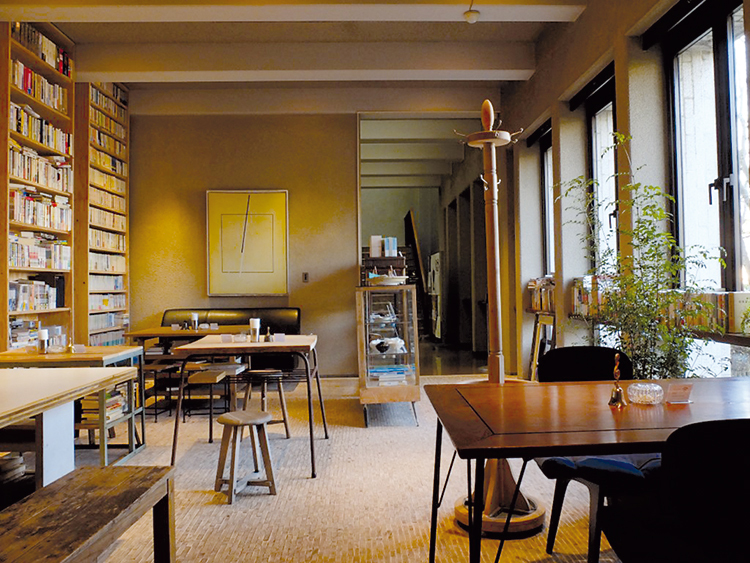 In this café, you can eat the original curry recipe of novelist Uno Chiyo, reputed to be an excellent cook; the typical breakfast described in Murakami Haruki’s Hard-boiled Wonderland and the End of Time (Sekai no owari to Hado-boirudo Wandarando, translated into English by Alfred Birnbaum in 1991, published by Vintage Press); the salmon tart, and the soup with beer dear to Sherlock Holmes; even the ox tongue inspired by Dazai Osamu — the menu isn’t limited by time or space. “We don’t try to recreate the recipes as a historian would or how they were originally made. I think the most important thing is to offer you food that will transport you into the world of a particular book or author”, Kusanagi yohei affirms. His chef, Nakajima Michel, suggests we try some dishes connected to the exhibits in the literature museum. Since it opened, the café has not only attracted dedicated researchers of modern literature wanting to consult the archives, but also visitors to the museum, from Japan or abroad, who love the work of Japanese writers. The food becomes a bridge to a world that can sometimes appear rather distant. Moreover, Kusanagi yohei would like to open a similar café in France. Why not in a location where we could enjoy dishes created by Alexandre Dumas or Marguerite Duras? From 9.30 am to 4.30 pm. Closed sunday and Monday, and the fourth Thursday of every month.